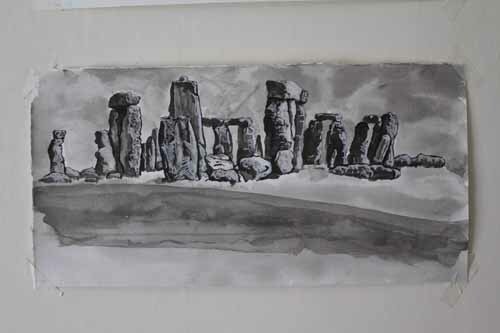 Our dear friend, actor, Colin Stinton, recently sent us a souvenir from a visit he made to Stonehenge in the 1970s. It’s a blue HMSO booklet dated 1975: Stonehenge – Department of the Environment OFFICIAL HANDBOOK – it declares on the front – 15p net. The first thing printed on the inside of the cover reads: STONEHENGE is two miles west of Amesbury, beside the road A344 to Shrewton and Devizes. Our year with the stones really was the end of one phase in the long life of Stonehenge. As part of the redevelopment of Stonehenge and the visitor experience, this particular stretch of the A344 no longer exists. Three days after summer solstice 2013 it was closed for good, the tarmac surface ripped up and at some point over the next year, it will be grassed over to blend in with the surrounding landscape. The aim of this is to unite the ancient Avenue with the stone circle and so partially restore the layout of the site to what is considered the original plan. Personally I’m glad to have had the experience of being on site with the odd convoy of tanks rumbling past the Heel Stone along the A344. The very real presence of the military has been part of this unique experience. 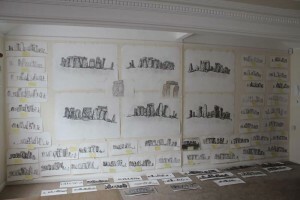 Mark has continued to make drawings in his studio. 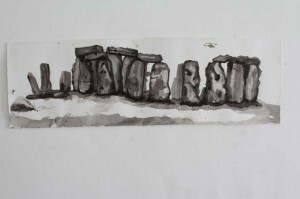 He now has six larger graphite works of Stonehenge made up from all the studies he did on site. 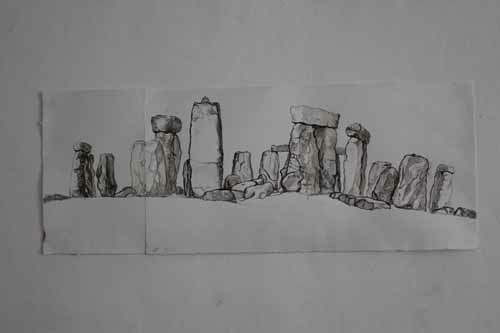 The six drawings are at 30°, 90°, 150°, 210°, 270° and 330°: a small tour around the outside of the stone circle. 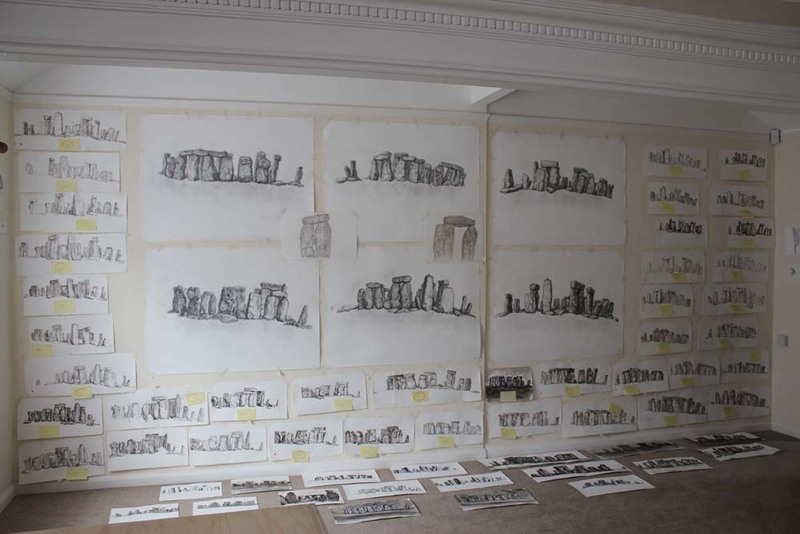 The studio is plastered with studies of Stonehenge. It reminds me of a crime scene; the one where the detective walks into the suspect’s lair and, confronted by this mass accumulation of images of the subject, knows at once that here is the manifestation of a disturbed mind. But then obsession has always been part of the creative process. So what have we learned from our year here? 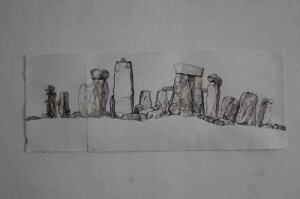 Accidentally, we’ve learned much about the tourist industry and the marketing of Britain under the Heritage label, and the names of various aircraft employed by our military forces, but our main focus has been towards the stones. We’ve garnered a huge respect for the peoples who made Stonehenge. Considerations of engineering such an ambitious project are well documented but essentially, Stonehenge is a massive sculptural form, each mighty stone individually honed to fit with its neighbours. Aesthetically it might not be a geometric fit with the values of beauty ascribed to classical principles – in spite of Inigo Jones’ attempts to make it so – but nevertheless, it is apparent to us that Stonehenge adheres to its own distinct aesthetic rules. The still visible tooling marks upon the sarsens are testament to the deliberate decisions made by the sculptors. People today visit Stonehenge with a huge repertoire of needs and wants, and, particularly because of its siting and the influence of the weather, the elements on the visitor experience, Stonehenge really can be interpreted… seemingly infinitely. It really can be all things to all people. It will deliver more or less exactly what you expect. I think this is nicely illustrated through Mark’s work, through his attempts to get a handle on the place through drawing. There are studies suggesting a story based approach akin to the graphic novel; some more expressionistic works, embracing the energy of the skies and the contours of the gently undulating monument field; and the meticulously detailed silverpoint drawings describing a surface marked and shaped thousands of years ago by our ancestors using basic tools, and the presence of nature, the slow growth of tiny organisms; vegetation on stone. Oscar Wilde famously wrote in his preface to the Portrait of Dorian Gray, “It is the spectator, and not life, that art really mirrors”, and this appears to be especially relevant to Stonehenge. What you want to find there, you probably will, even if you count yourself amongst the most objective of minds.